Common Frog and Frog Spawn. Image by Laurie Campbell. My third, and favourite, sight in March, has to be the delightful, croaking mass of mating frogs, piled in ponds across the country. A large percentage of my childhood was spent peering into the murky water of our pond, or spooning out gelatinous spawn into jam jars (something which I’m not sure should be encouraged!). But this is the delight of the Common frog (Rana temporaria), they are easy to encourage into the garden, and can provide hours of diversion for adults and children alike. Even the cat was suitably intrigued by them. Common frogs return from their land dwellings to ponds in late February and March, to start breeding, which they are very vocal about, with the males croaking alluringly. The females, which are smaller than the males, lay around 4000 eggs in spawny clusters. 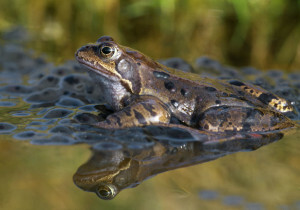 Common frogs return from their land dwellings to ponds in late February and March, to start breeding, which they are very vocal about, with the males croaking alluringly. Image by Laurie Campbell. Predator numbers being low, you can expect the happy squirming of tadpoles within a fortnight. Watching their development from egg to frog is a fantastic tool for getting kids excited about wildlife, as is (carefully) exploring long grass around the pond for adult frogs. The adults are between 6 and 9cm long, and can be a whole range of colours and patterns, sometimes one can recognise individual visitors to the garden. Most people are aware of frogs using their long tongues to catch small invertebrates, whilst tadpoles are mostly vegetarian, feeding on algae. But- did you know that frogs have no ribs? Building a pond is generally the first suggestion to making a wildlife garden. 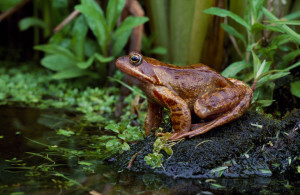 Experts emphasise the importance of keeping the pond of varied depths, having a slope or beach area for easy exits, and of waiting for frogs to come to you (as opposed to collecting your own frogspawn). It pays to be aware that most pet fish will eat tadpoles, as will hungry newts.